Obituary for Mary Elizabeth (Gunter) Hopkins | Thomas Funeral Home P.A. HARLINGTON, UK. – Mary Elizabeth Hopkins passed away peacefully at Clare House Care Home, Uxbridge, ENGLAND on Monday Jan 28, 2019. She was born in Harlington, Middlesex on May 2, 1935 and was the daughter of the late Wallace and Winifred Gunter. In 1956, Mary married Reginald Ewell Hopkins of Cambridge, Md. Ewell was a USA air force officer and was stationed at Northolt Air Base near London, England. It was during this time that they met and started their life long relationship. The family home was back in Harlington (Mary’s place of birth). They had three sons Mark, Steven and Paul. Mary and Ewell worked hard in setting up their own business in Harlington eventually naming their business The Village Pharmacy and this became a central part of the community. From this Mary and Ewell recognised the lack of facilities in the area for people with end of life illnesses. As such in 1984 they formed a small local group of volunteers to help set up a Hospice. They worked very hard to set up the funding required to get the hospice off the ground, engaging with local businesses to raise money and arranging various fund raising activities. Ewell passed away in 1990 but Mum found the strength to carry on working and fund raising for the hospice. 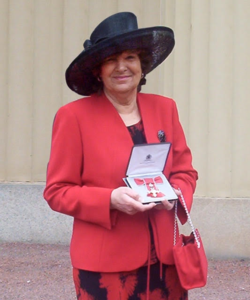 Her hard work and dedication was rewarded when she received her MBE from the Queen in 2005 for services to charity. Mary became very ill in 2012 when she suffered from encephalitis. Her determination was such however that she pulled through, the illness did leave an impact though on her daily life. Following a stay of 5 months in Clare House Nursing Home Mary became ill and spent a month in Hillingdon Hospital. Her wish was to spend her final days back at the Nursing Home where she passed away peacefully with her family around her. Mary was loved by many but closest to her heart were her 11 grandchildren and great grandchildren – Nicola, Rachel, Chloe, Danielle, Thomas, Sophie, Katie, Ross, Emila, Ella and Zachary. A memorial service will be held on Thursday, March 28, 2019 at 10 am at Christ Episcopal Churchyard. Arrangements are in the care of the Thomas Funeral Home, P.A. in Cambridge.